Please contact Rival directly for more information on gravel solutions. RUBIX is not restricted to “on-road” applications. 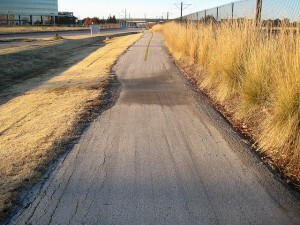 Similar concepts and methodologies can be applied to rating conditions on sidewalks, pathways, and bike trails. Maintaining these types of networks is critical to pedestrian safety and public transportation. Rival offers efficient, low cost solutions to determine condition and maintenance requirements of this infrastructure. In addition, specific value-add data, such as sidewalk geometry (slopes, grades, etc.) for input into accessibly reviews / standardization is also able to be gathered with the RUBIX data-capture apps.